What do you get when you combine beer, cheese, and zucchini? Bread! My Cheddar Cheese Zucchini Beer Bread to be exact. 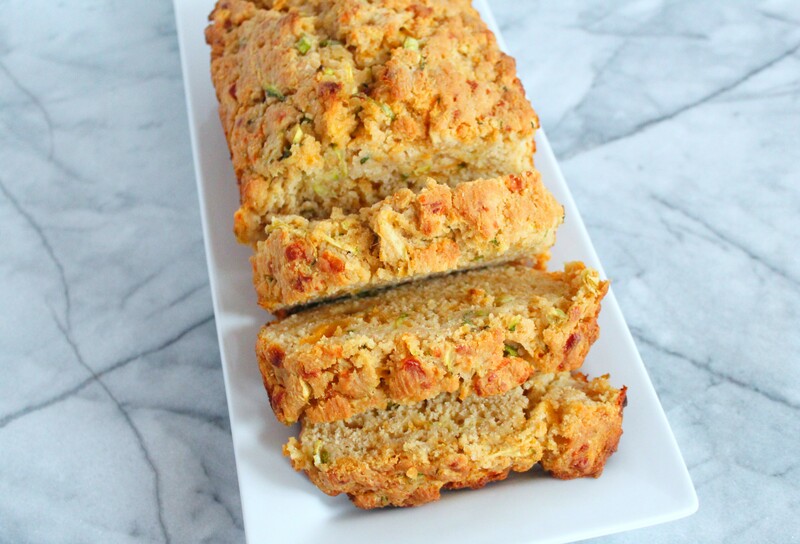 This delicious quick bread is loaded with cheesy, buttery goodness. You won’t even notice the veggies I snuck in. This month, the recipe redux members are baking bread. I’m not the most patient chef, so waiting for bread to bake or yeast to rise is out of the question. That’s why I love making beer bread. It’s quick, easy, and requires virtually no wait time. Plus, the beer adds fantastic flavor! Preheat the oven to 350°F. Grease 9x5x3-inch bread pan. In a medium-sized bowl, whisk flour, baking powder, salt, and granulated garlic until well-combined. Add cheese, zucchini, and chives. Slowly pour the honey and beer into the mixture. Stir until combined. Pour half of the melted butter into the bottom of the pan and spread it around evenly. Add batter to the pan and brush the remaining melted butter over the top. Bake for 45-50 minutes, until golden brown and a toothpick inserted into center of loaf comes out clean. Allow bread to cool in pan. Run a knife along the edge of the pan to release.